Solution Focussed Thinking: some basic assumptions. Janus: A God for doorways. 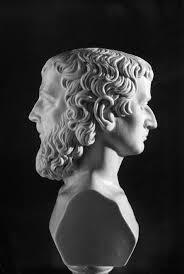 Janus is the Roman God of new beginnings. He is represented with two faces. Usually an old man looking back, full of past experience, and a young man, fresh faced and eager looking forward to the future. Because he is the God of new beginnings, January when the old year gives way to the new, is named after him. Interestingly he is also the deity of doorways – places where we pass from the old to the new. Gateways to new opportunities. This image of a new, younger person looking forward to the future, while holding their past experience in mind, is an apt one, and Janus would be a sound choice if the Greeks or Romans were looking for a suitable candidate to become the God of Solution Focussed Brief Therapy. Solution Focussed Thinking is a process of looking forward to a preferred future, and at the same time, using past experience to highlight the strengths and skills we already possess. Skills that we can use to reach our own preferred future. Solution Focussed Thinking is grounded in several basic assumptions. Humans live their lives in a social context. Human beings are most successful, and thrive best in the company of other people. We are described as being a social species. For this reason, solitary confinement makes an effective punishment or form of torture. A small number of people find an isolated and solitary lifestyle to be enjoyable. Part of this ability comes down to a process of natural selection, which is especially useful in places like northern Scandinavia or Alaska, where it can be dark for up to six months of the year. The ability to survive in such an environment is due to the values and skills that the inhabitants of such inhospitable places pick up, and which come to be part of the culture. Those who can deal with this lifestyle – through a mix of genetics and culture – remain; while those who cannot tolerate this social and geographical isolation move away, thus ensuring an increased prevalence of the traits that permit humans to survive in such places. However, even in very isolated places a strong sense of community persists, and provides the shared experience that gives a sense of belonging. The erosion of this sense of communality may make an active contribution to the current epidemic of depression that is sweeping across the western world. Human society depends on language for effective functioning. In this context the term language is used in its widest possible sense, and does not just refer to the words we choose to use. Human communication is complex, and the research suggests that the words we use provide only 7% of the meaning contained in any spoken communication. When language is used to provide information, context is everything, and it is these differing contexts that explain why people from different cultures, even ones that seem to be very close in heritage, manage to misunderstand each other. Tone of voice, facial expression, the speed and rhythm of speech, the place and time where the words are heard, all help to convey the precise meaning of what is said. The fact that the person who is talking does so under duress, with a gun to their head, can also influence the message that we hear! Language is so flexible that it possible to say something in such a way as to make words mean their exact opposite. Everything is a story, a narrative, a sequence of events with characters communicating an emotional content. We only accept as true what can be narrated. Andrea’s Corelli – The Angel’s Game. Humans use language to construct their world. We use language to give structure and substance to our world, and not just to describe it. The choice of the words that we use to describe events gives meaning to our lived experience, indeed the words that we use can change our view of the world completely. One example could be seen during the bushfires in New South Wales a couple of years ago. The press asked a leading expert on Post Traumatic Stress Disorder how many children were likely to suffer post traumatic symptoms because of the fires. He gave a figure of about 8%. This lead to a government and public outcry, and there was a rush to provide counselling and other interventions to all who might have been affected, at the cost of several million dollars. If the press had reported the corollary of the reported figures i.e. twelve out of every thirteen children would be fine, perhaps the government might have acted in a more sensible fashion. I need to get another new iPhone. It can be seen that the choice of words, and the emphasis given to what is said, has a significant impact on the listener. Politics and advertising are based on using words in this way, in an attempt to persuade others to a particular, partisan point of view, or to get some other message across. The intent is to persuade the audience to believe something that serves the politician’s or advertiser’s agenda. We end up voting out of some magnified misperception of risk, or suddenly find ourselves needing yet another new iPhone. Everybody has their own individual way of using and choosing words, so it is vital to use the client’s own language when talking about things. If we share in the same language game, or at least try our hardest to do so, we put ourselves in the best position to ensure that what we talk about has meaning to our clients, and that this understanding will arise out of a shared understanding. Thought also seems to use language, and provides a way for us to converse with ourselves; for the majority of us this involves the use of words in a kind of internal dialogue. The tone of these internal thoughts also has a dramatic effect on our world view. If we can use language to help change how people think about themselves, and the world that they inhabit, then they can begin to imagine the changes they want to accomplish, and so can bring them bout. Language is a powerful tool for helping others. A solution focussed approach uses language in a positive way, by encouraging the client to see the positives that already exist in their lives. The meaning of the words we hear is influenced by our state of mind, so that the current emotional experience of the listener plays a significant role in how they interpret what they hear. This is a two-way street and words can also influence our state of mind. A process that is seen in the use of cognitive Behavioural Therapy. When we are in negative or depressed mood states it is much easier to think even more negative and unhelpful thoughts, so if we are in an anxious state it is very easy to misconstrue innocent environmental cues to trigger our anxiety even more. Similarly, when we are in a positive state of mind it is easier to find more positives upon which to focus. It is interesting to see how being in love blinds us to all the negative traits in our partners! Making a choice to concentrate our attention and focus on the positives in our lives can have major positive effects on our mood and relationships. Competence and resourcefulness are the norm. Human beings are basically competent and resilient, it is the events of our lives that leave us feeling powerless and incompetent. We all have strengths that we can mobilise to make the changes needed to improve the quality of our lives. However, it is often hard to recognise these for ourselves, especially when under stress or in a difficult situation. Looking for strengths, and providing evidence for their existence from the person’s past experience and behaviour can enable them to start to use these strengths and begin to steer life in a more satisfactory direction. Focussing on strengths when we talk, can help to turn the conversation away from the temptation to judge or blame, instead it helps highlight the skills we have used to survive so far. No matter how bleak and awful an individual’s environment may appear there are still resources, however small, that can be mobilised. To explore the past and uncover these resources requires a collaborative approach. It helps us to see ourselves for ourselves, and to have the last word in deciding what we need to do to change our lives. Using language that is future focussed and which sets out to elicit what are genuine positives helps this process to evolve. Focussing on strengths, and emphasising positive explanations through reframing, helps to increase both a belief that change really is possible and to enhance the motivation to bring it about. Solution talk is more helpful than problem talk. A solution focussed conversation is future focussed, and concentrates on eliciting what is called the client’s preferred future, and in as much detail as possible. The world as it is when their difficulties have come under control. Problem talk magnifies the impact of past problems and creates a perception of even more problems. In a therapeutic setting this starts by using language that helps focus the client onto their future “problem free” state. A vision of a life that fits within their new world view. How will you know that talking with me today has been helpful? What will tell you that you no longer need to come? What will you be doing when you “have your life back”? There is a deliberate and active choice to focus the client’s attention onto a realistic perception of positive future experience, helping them to uncover solutions to their difficulties that are based on their strengths, rather than getting bogged down in conversations about past problems to start concentrating on making changes to their lives that they can achieve. Problem talk magnifies the impact of past problems and creates the perception of even more problems, helping to bury the client even further in a quagmire of chaos. Solution talk, on the other hand, brings the client’s focus onto positive experiences, highlighting the resources that have been helpful in their lives so far. This helps us to create even more solution ideas. When people talk about their problems we listen attentively. Rather than get bogged down in exploring their difficulties in detail we are more interested in what is revealed about their ability to cope. By avoiding the temptation to analyse problems we can help to convert negative, ruminative cycle into positive chains of thought. The words that we choose to use in any conversation can alter the personal meaning of any experience, altering our perception of what happened. Even a slight change in emphasis has an impact on the outcome of events. Solution Focussed Thinking uses words to change other peoples’ worlds. For this reason, we need to choose our words with great care. Categories: Mental health, Positive psychology, Solution focus, Solution Focussed Thinking | Tags: Brief Therapy, Preferred Future, Solution Focussed Therapy, Solution Talk | Permalink.